The year was 1964. Whenever one entered the office of the then Director of the Ashok Hotel Cultural Wing, late A.J. Jaspal, what arrested the visitor were three oversized photographs, dwarfing everything else in the area, of Yamini Krishnamurty, Sonal Mansingh and Uma Sharma – the three “prima donnas of Indian classical dance” as Jaspal described them. 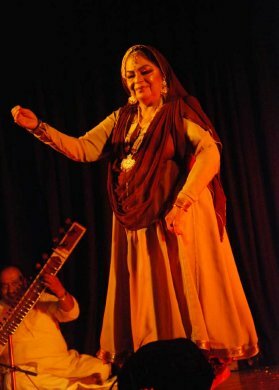 I was witness to Uma Sharma, at the time evolving as a sophisticated Kathak dancer for the proscenium, her artistry in abhinaya giving her an edge over other Kathak performers. I still recollect her performing to Surdas verses, describing the first meeting of young Krishna and Radha in Brindavan –“Bhoojat Sham, ‘Kaun tu Gori?’” (“Who are you fair one?” asked Krishna). Thundering applause greeted the dancer’s presentation of the item.